This is an activity that I incorporated into my collaborative rotations for my students. It helps my students understand the onset and rime a whole lot better and it also makes it fun! You will need: stick (recommend a single to-go chopstick or even a pencil) and a paperclip. Also, you will need magnetic letters/letter tiles. If you don't have magnetic letters or letter tiles, I have included printout of letters/blends! There are 14 spinners with DIFFERENT rimes and students have to draw a letter (or blend) to make a word. 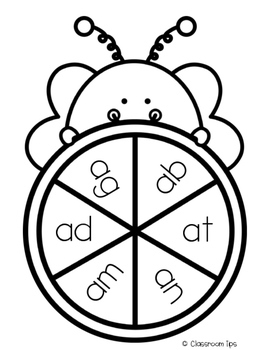 This gives them that practice on forming words and sometimes nonsense word. It really pushes them to blend the words together. With this download, you are getting 14 colored spinner mats and 14 black and white spinner mats. 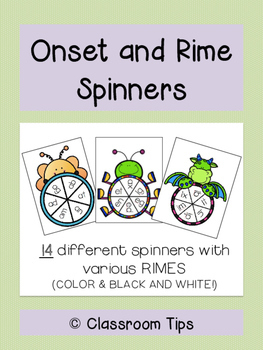 In addition to that, I've also made those spinner mats with underlined rimes to make it easy for kids to identify which rime they are forming (so they can read the rime the correct way). -Highly recommend to print on cardstock and laminate for durability! 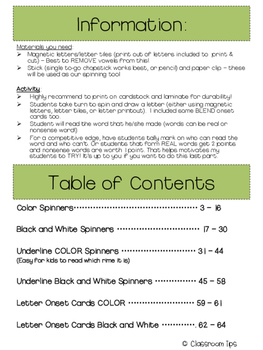 Students take turn to spin and draw a letter (either using magnetic letters, letter tiles, or letter printout). I included some BLEND onset cards too. -For a competitive edge, have students tally mark on who can read the word and who can’t. Or students that form REAL words get 2 points and nonsense words are worth 1 point. That helps motivates my students to TRY! It’s up to you if you want to do this last part.